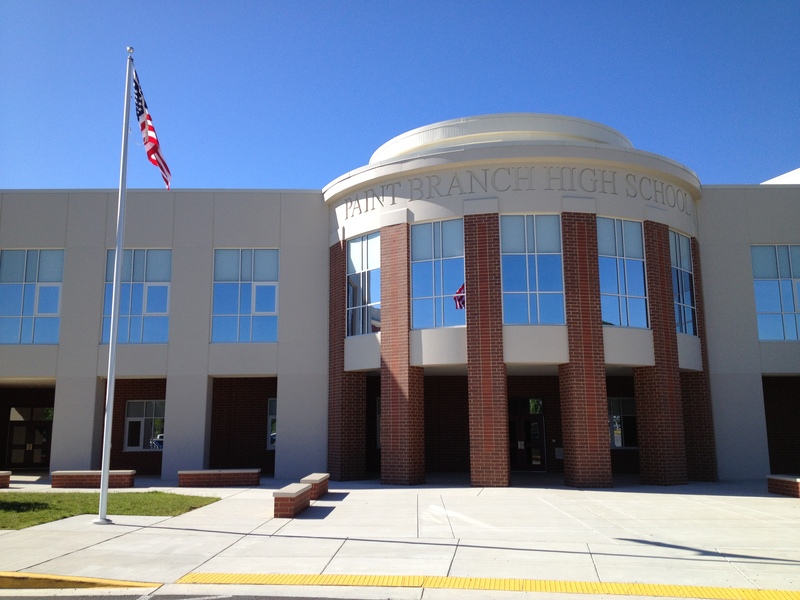 Paint Branch High School in Burtonsville. East County elected representatives will be available for a public forum Tuesday night at Paint Branch High School in Burtonsville. One Montgomery will be there, advocating school equity as a means for creating a stronger community. Stand up with us. Several elected officials will be there, including state Senator Karen Montgomery, Delegates Anne Kaiser, Eric Luedtke, and Craig Zucker, County Councilmember and Education Committee chair Valerie Ervin; and Mike Durso of the Board of Education. Larry Edmonds, Northeast Consortium Vice President of the Montgomery County Council of PTAs will be there as well. 1. Why is it acceptable that NEC kids score so much lower than West County kids, year after year after year? 2. Why is it okay that students have such wildly different educational experiences, even within the same school? 3. What is MCPS doing about underperformance in high-poverty schools? Just the Innovation School pilot? How exactly is that going to help us? 4. People over here are starting to use words like “blight.” Does blight cause our schools to do worse? Or do our schools cause blight? 5. It is Board policy to provide more resources to high-poverty schools. Where are the resources? 6. Many NEC and DCC schools receive a subsidy for smaller K-2 class sizes. How much money is that, per school? Is the subsidy paid from taxpayer money, or just Title 1 money? 7. Why doesn’t MCPS subsidize smaller class sizes in Grades 3-5 and 6-8? Or do you have something better to do with the money? 8. What is MCPS doing to see that our high-poverty students have the most experienced teachers with a track record of success? It looks like the most experienced elementary teachers teach where the need is least. 9. Does MCPS have test score targets and a schedule for bringing our schools up to an equitable level of performance? 10. The White Oak Science Gateway seems like an excellent development for the County as a whole. How will it affect the demographic composition of our schools, and our students’ academic success? Has any thought even been given to this? 11. The Delegation seems to have the idea that “if it ain’t broke, don’t fix it.” How can our East County representatives possibly have that idea with respect to East County schools? And in Senator Montgomery and Delegate Kaiser, we have two of the most powerful education representatives in the Legislature. What’s going on? 12. Do you advocate meeting the needs of the East County, or do you discount these needs in favor of others’ interests or some conception of whole County good? If you discount, how do you strike a balance, and who will represent our needs? Our East County neighbors and students need you! We’ll see you on Tuesday. 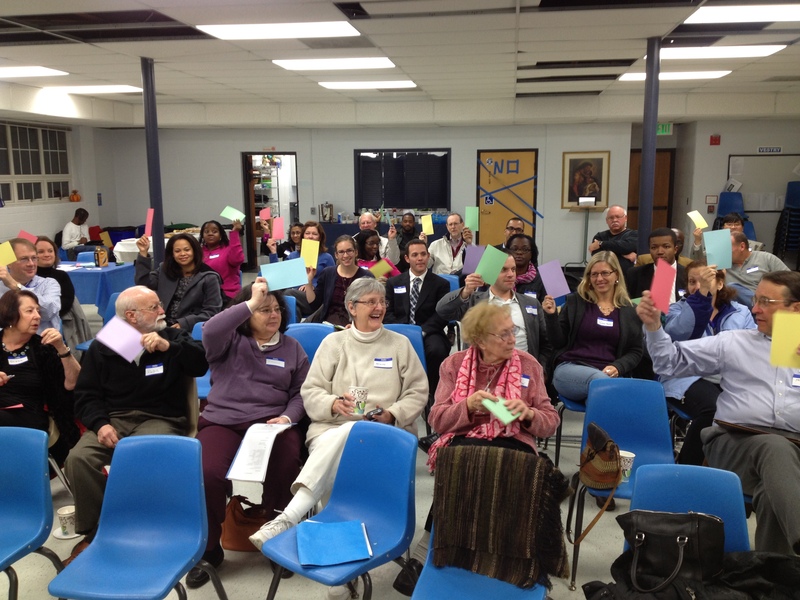 The crowd at our first community workshop at Episcopal Church of the Transfiguration in Colesville. 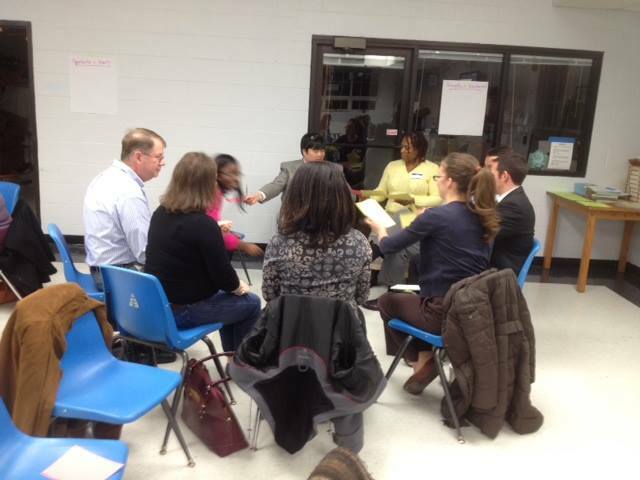 Thanks to everyone who came out to our community workshop last night in Colesville. About 30 people came out to the Episcopal Church of the Transfiguration for a meeting about the achievement gap in Montgomery County Public Schools and how to make our schools stronger. It’s exciting to see so much community support for strong schools. It was an ambitious agenda for the first community meeting of the members of One Montgomery, an organization formed this summer to look at the problem of declining test scores in schools of the Montgomery County Public Schools Northeast Consortium and see how the trend can be reversed. Ed Wetzlar was one of the founders of the group, along with Fred Stichnoth and Adrian Lees, all Silver Spring residents living in the Northeast Consortium area. Although originally focused on the Northeast Consortium — which encompasses James Hubert Blake, Paint Branch and Springbrook high schools, along with five middle schools, 16 elementary schools and the Carl Sandburg Learning Center — One Montgomery would like to have a farther reach, Wetzlar said, working for equity in education throughout the county. We’re not done yet. Next Tuesday, several elected officials from the school board, County Council, and state delegation will host a Community Concerns Forum at Paint Branch High School in Burtonsville. We’d love for you to come out and join the call for more resources in underperforming schools. For more information and for other upcoming events, visit One Montgomery’s calendar page. Room 1024 (enter the school by the bus parking lot). 2. MCCPTA did not tweak its budget priorities resolution to address directly the needs of NEC, DCC and other underperforming schools (as had been suggested in a One Montgomery memo). See what MCCPTA wants. 3. The NEC, DCC, Gaithersburg, Watkins Mill and Seneca Valley (fka the red zone) are gap central. MCPS’ weapon against the gap is the Innovation School pilot. How’s that innovation thing working out for you? Watch and tell your Board of Education on November 12, mid-afternoon. 5. We need to join together, strategize and politic to get what our kids need. That is the goal of the November 14 One Montgomery meeting. Please come; please ask your friends to come; please publicize the meeting in your schools.